Gulf State Park offers a 496-site improved campground with 11 modern bathhouses. 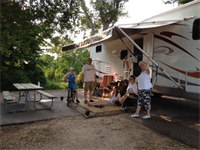 The campground offers: pull-thru sites, back-in sites, water front campsites, and ADA accessible sites. The campground is approximately 1-1/2 miles from the Gulf beaches. All camping pads are paved and big enough for large RV's with pullouts. Tents are also welcome in our campground. All sites have water, sewer and electric (20,30, & 50 amp). All sites have a picnic table and pedestal grill. There is a laundry facility located beside the camp store to accomodate our guest. There are two playgrounds located in the campground. We also have a splash pad, pool, and tennis courts for our guests to enjoy!